Sailing vacations in Greece more and more double as the perfect romantic honeymoon cruise and over the last decade such a honeymoon cruise in Greece has become really popular and some include even the actual wedding ceremony. Note, that the captain of your cruising yacht is only allowed to perform the actual wedding when the yacht is in international waters, in Greece and also in Turkey this will be very difficult but a local priest on one of the myriad islands in the Aegean is usually honoured when asked. Remember, the concept of a honeymoon cruise Greece is certainly not new. The most romantic honeymoon cruise areas in Greece is undoubtedly the Dodecanese region plus the adjacent waters of the Cyclades and the Eastern Sporades. The Dodecanese: Rhodes, Nisyros, Astypalea, Kos and Symi. Yet, this last cruising area has the advantage since it is close to Bodrum in Turkey where the gulets originate from. Gulets, (motorsailers, goulettes, caiques or gullets), are the ideal and most romantic cruise vessels around. Although new or recent built these motorsailers still resemble the endemic fishing boats, but are now fitted with every luxury you can imagine. Gulet cruises fall in the same category as superyachts and other luxury yacht charters. Excursions, diving, air-conditioning, chef cook, remote translucent blue bays along the Turquoise coast, ancient Greek temples and other archaeological sites, volcanoes, glorious sunsets, Greek music : all is standard on a honeymoon cruise in Greece. Note, that a gulet cruise is often called a blue cruise or a blue voyage, especially along the Turkish coastlines and the Dodecanese islands! But also the regular - although less luxurious and without air-conditioning - charter yachts such as Jeanneau Sun Odyssey, Beneteau Oceanis, Ocean Star or Bavaria yachts could be ideal for your honeymoon cruise in Greece. These cruises can either be skippered cruises or bareboat, yet for the latter option you or your partner needs to be qualified to skipper the yacht. 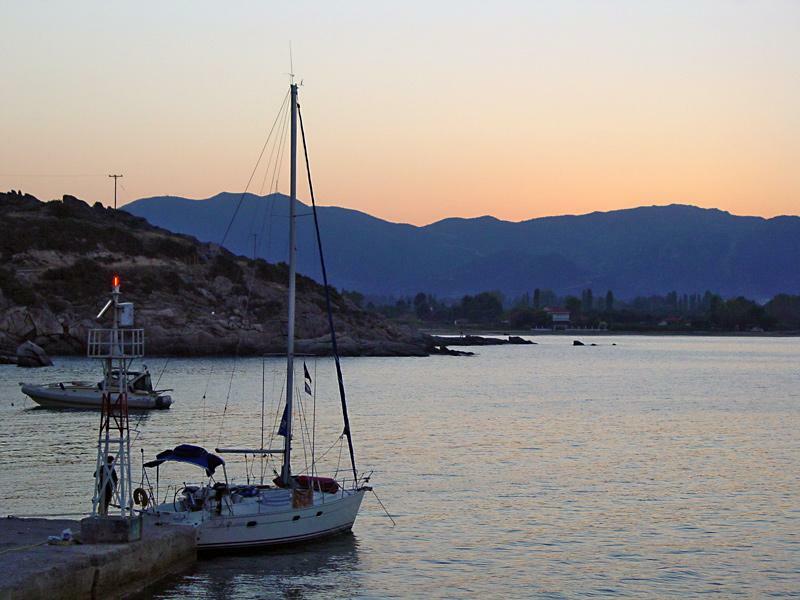 Another region which would be ideal for your honeymoon cruise in Greece is the Ionian, especially out of Lefkas.
.: Our cruising logbook in Greece. :.